The announcement of the finalists for this year’s Walkley’s awards may be the first recognition of microcopy by the mainstream media. 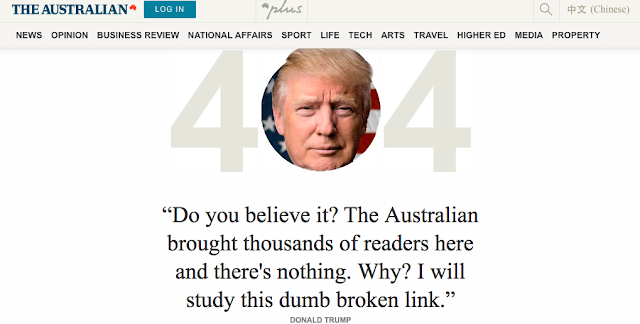 In the category of Headline, Caption or Hook, The Australian newspaper’s website has been nominated for its cute 404 error pages. The pages are little gags about how politicians respond to failure, like former PM Paul Keating announcing “This is the 404 we had to have.” Then there’s George Brandis saying “If this is going to be like explaining metadata to David Speers, kindly count me out.” Over forty randomly generated messages written in the style of flubbing politicians pop up whenever you hit a page that no longer exists. Most are penned by Strewth columnist James Jeffrey, who uses these glitches as a chance to splash a few laughs across the website. Rather than just a dry 404, this playful content hits a sweet spot with readers as well as award judges. It’s easier to forgive an error with a smile. Microcopy (the small messages you get on error pages, button text, loading messages or even thank you emails) is a chance to craft content that distinguishes you from the rest of the herd. It is the small stuff worth sweating. The Australian isn’t the only organisation investing in its 404 pages. 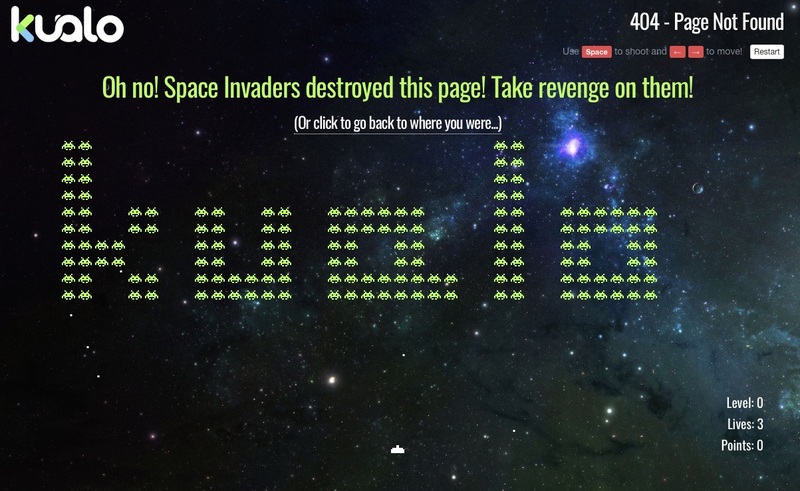 UK-based web host Kualo know their nerdy audience so well that they embed their 404 page with a Space Invaders mini-game. 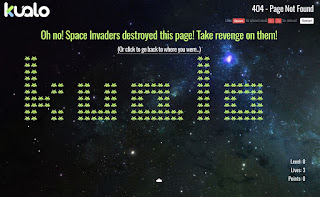 Kualo's 404 page also manages to include their tricky name. At the US’s National Public Radio (NPR), they bank on serendipity and metadata to apologise for the mistake. Hitting the NPR404 page serves up an apology as a chance to explore more content: “Stick around to browse through NPR stories about lost people, places and things that still haven't turned up.” Then there’s a selection of stories about things being lost, from Amelia Earhart to your luggage. It’s that extra bit of effort that helps your users feel like the interaction is with you rather than a machine. Probably the best exponents of playful microcopy are Mailchimp. If you’re setting up an account with Mailchimp and the username you’ve chosen already exists, you don’t get some dull error message. Instead, you get: “Another user with this username already exists. Maybe it’s your evil twin. Spooky.” It gives the basic information with a smile on the side. This might sound like a blank cheque for creativity. It’s not. The voice and tone section of Mailchimp’s style guide warns against too many jokes or forced humour. Their best caution is “When you’re writing, consider the reader’s state of mind.” If your user is frustrated by not being able to find a crucial page in signing up, or is about to make a financial transaction and needs to trust the site, then now is not the time to break out the LOLs. Used judiciously, microcopy can spark up a website, distinguish its brand and build a better relationship with users. And that’s worth more than a catchy headline when users are lost.